This is a follow up regarding a post here in February 2013 where I reported on my attempts to save 25+ coast live oak trees from being cut down by East Bay Municipal Utility District (EBMUD) for construction of a pedestrian path on land owned by EBMUD. I and others in the neighborhood could not fathom any good reason to remove a healthy grove of oaks given their rare occurrence in Oakland. As a result of that post I was able to have EBMUD review their plan to remove so many oaks and I participated in a meeting with the landscape consultants, sharing with them my findings that the oaks were showing good health with no sign of sudden oak death or other diseases or pests. At that time I had hope that many of the oaks would be spared. The project was completed earlier this year and last week I had an opportunity to visit the site. I first noticed that most of the original oaks slated for removal were gone. My earlier efforts had saved only a handful of trees. The largest oak in the grove, one that I and many of the neighbors had hoped could be spared, was also gone. In its place was a large open sunny area with a gravel path going through it. Walking through what remained of the oak grove I quickly noticed wounds on the trunks caused by the workers undertaking the removal of the oaks. That prompted me to inspect more carefully the remaining oaks. At this point I cannot put into words my feelings around what I witnessed. 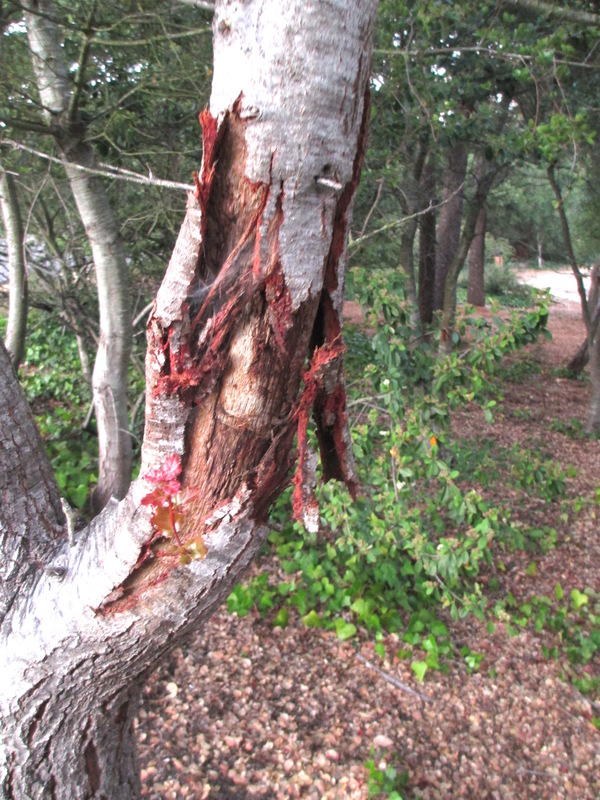 Instead, let me share with you photos taken of the damage done to the trees by EBMUD, the ‘stewards’ of this land. These photos show a careless disregard of the trees. I counted at least 18 oaks that had sustained significant damage during the project. And in one case, the damage done to the tree was clearly intentional! Take a look at the last two photos of this series. They depict an oak that had been girdled with an axe or some other sharp edged tool. Why? Really, WHY? I met Ryan Masters at Tassajara a few months back while I was teaching a workshop on fire mimicry. He is a delightful person and impressed me as knowledgeable and sincere, so I shared some important Native American wisdom with him. He followed up diligently and the result is this fine article about an Ohlone oak stonehenge here in California. Ryan also wrote this wonderful article about his adventures in the Ventana Wilderness and the Native American “Hands” rock shelter.